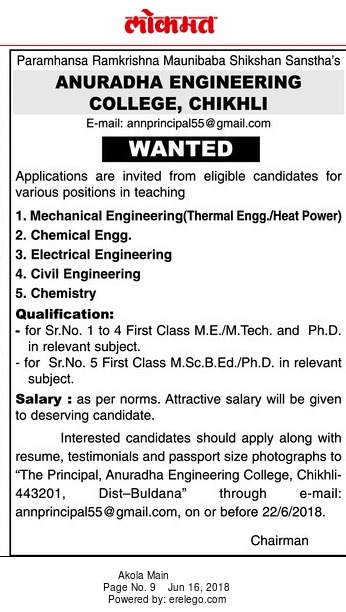 Anuradha Engineering College, Chikhli has advertised in LOKMAT newspaper for the recruitment of Faculty job vacancies. Interested and eligible job aspirants are requested to apply with in 22nd June 2018. Check out further more details below. About College: The Institution is situated in the Anuradha Nagar, Chikhali, Dist. Buldana in Maharashtra state. The campus is situated on a sprawling 37 acres land, 3 km from Chikhli town on Sakegaon road. The institution has developed a beautiful campus with Residential facility for the students and staff, Sport facilities, Garden, Canteen, etc. Engineering is a noble career which one can pursue in the field of manufacturing, fabricating, marketing, research and even business administration and consultation. It is one of the cream professions opted by the intellectuals. It can be an endless profession because of its continuous untiring efforts to make the human life easy and comfortable.